Available Size: 15", 17", 18.5", 19", 21.5", 22", 23.6", 24", 26", 27", 28", 30", 32", 37", 42", 46", 47", 50", 52", 55", 60", 62", 65", 70", 80", 82", 85", 90", 92", 100", 120", 150", 200"
An infrared touch screen uses an array of X-Y infrared LED and photodetector pairs around the edges of the screen to detect a disruption in the pattern of LED beams. These LED beams cross each other in vertical and horizontal patterns. This helps the sensors pick up the exact location of the touch. A major benefit of such a system is that it can detect essentially any input including a finger, gloved finger, stylus or pen. It is generally used in outdoor applications and point of sale systems which can not rely on a conductor (such as a bare finger) to activate the touch screen. Unlike capacitive touchscreens, infrared touch screens do not require any patterning on the glass which increases durability and optical clarity of the overall system. Infrared touch screens are sensitive to dirt/dust that can interfere with the IR beams, and suffer from parallax in curved surfaces and accidental press when the user hovers one’s finger over the screen while searching for the item to be selected. 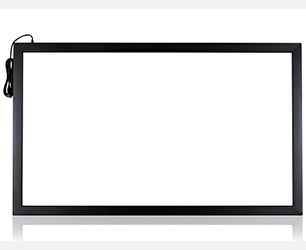 A rear projection screen or LCD or LED display can be added the touch function by adding the infrared touch screen. Objects placed on the sheet are detectable by the infrared. When the projection screen or display screen is touched by the user the deformation results in leakage of infrared light, which peaks at the points of maximum pressure indicating the user's touch location. 3. Sample for testing acceptable, 3-5 days delivery time after payment confirmation. 4. Application: digital photo frame, vehicle GPS, POS, kiosk. ad displayer, ATM, inquiry machine, terminal equipment, self-service device, medical equipment, industrial equipment, game machine, education displayer, ticket machine, etc.